Staghorn Sumac is a tree/bush like none other. It is easily identified by the large red burgundy cone shaped berry clusters adorning it’s branches. To my knowledge there are no look-a-likes to the Staghorn Sumac. The name “Staghorn” comes from it’s branches – as they are covered with a “velvet” layer similar to a stag’s antler. This tree is comonly found along tree lines and fence lines and can be spotted from a long way away – especially in fall and winter – the red clusters against the white, brown and gray landscape is unmistakable. 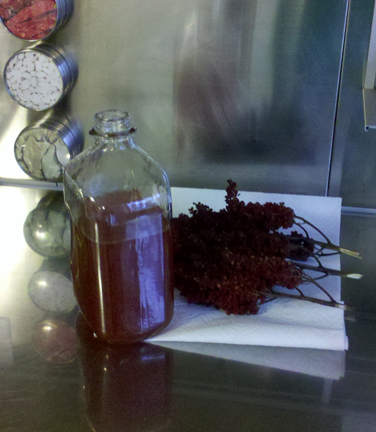 Every fall I use the berry clusters of the Staghorn Sumac to make a variety of tasty wild teas – hot and cold. I’ve heard Sumac Tea referred to as “Sumacade” and “Indian Lemonade” – and rightly so because the best way to describe the flavor would be in the tangy lemonade family. The sumac berries are best harvested in early fall before too much rainfall. The tangy flavor is actually contained is water soluble crystals that cover the berries – so rain washes it off over time. Thus, do not wash the berries after you harvest them because it is this dusty coating on the outside that you are interested in using. The easiest way to make Indiana Lemonade is to simply let the berries sit in cold water for 15-30 minutes. This is enough time for the crystals to dissolve and release that natural tangy potion that makes your sumacade. This is really great to do on hikes or camping trips to “tang” up your water a bit. You can also boil the berries in a pot of water for a few minutes to make Hot Staghorn Sumac Tea. When I make this hot tea, I simply cover the berries in boiling water then turn off the heat and let the berries sit for 10-15 minutes. 6 berry clusters typically makes a nice pitcher of tea. The result is a deep pink fusion. I then strain the tea through a cloth to get out some of the debris. Finally, I sweeten to taste with honey. After a few cups of hot tea I then bottle the rest and keep it in the fridge for later. You can almost always find a jug of brewed sumac tea in my fridge from September-January. 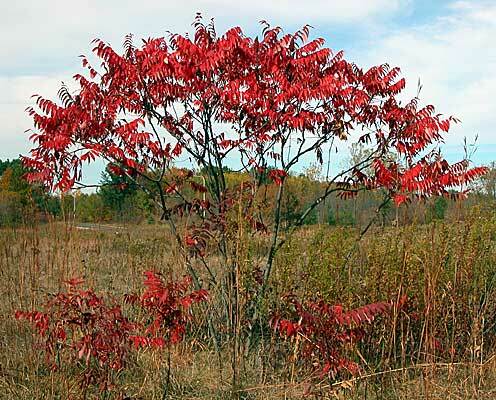 So as you are considering some fall wild edibles this time of year – don’t forget the Staghorn Sumac. I think you will be pleasantly surprised with it’s very interesting tangy flavor. Watch out Snapple – we may be on to something here! Thank you for posting this about the sumac tea. I would like to find out though what is the best way to store the berries that you harvest? I am looking forward to a big harvest this coming year and would like to know if it’s ok to freeze them if I want to use them as a tea later. Also do you have a jam/jelly recipe for it?